Citi's call for Greece exiting the EMU in the next 12 to18 months with a 60% probability (see discussion) looks even more out of sync with current expectations. 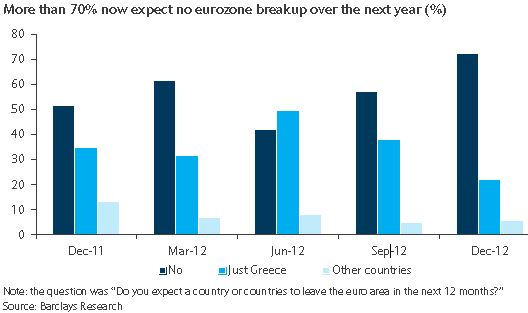 The latest survey from Barclays shows that 70% of investors do not expect any nation to drop the euro next year. This chart shows how responses changed over time. After all, the Eurozone leadership pulled all the stops out in order to prevent EMU's breakup. That included bringing in the full force of the ECB in the name of fixing the "monetary transmission" (see post) in order to provide central bank funding to periphery governments. The betting markets seem to agree. In fact Intrade odds are 77% that no nation will exit the union next year. With Greek debt nearly converted to "zero coupon perpetual bond" (see discussion), the probability of near term default and/or exit has collapsed.